For the past seven years, AATB members and AATB accredited tissue banks have been invited to submit nominations of tissue recipients to ride and deceased tissue donors to be honored by a floragraph, a portrait created with floral materials, on the Donate Life Float in the Rose Parade. The AATB is pleased to announce this year’s AATB Donate Life Rose Parade Float honoree: floragraph honoree Andy Hendel. 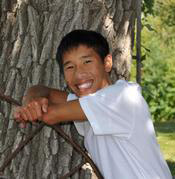 Andy Hendel was born in 1995 in Vietnam and was adopted, along with his twin brother, into the Hendel family in 1996. “Andyman” grew up in rural Minnesota. He was active in sports and had a passion for community service. Andy died by suicide at the age of 16. He donated cardiovascular and musculoskeletal tissue and, to date, Andy’s gift has helped 63 recipients across 25 states, with ages ranging from 15 to 82 years old. Andy was nominated by American Donor Services of Hastings, MN. The American Association of Tissue Banks (AATB) — a professional, non-profit, scientific and educational organization — is the only national tissue banking organization in the United States. Founded in 1976, the AATB is dedicated to improving and saving lives by promoting and advancing the safety, quality and availability of donated human tissue. To fulfill that mission, the AATB publishes standards, accredits tissue banks and certifies personnel.